Since the last issue of Wood Matters the NZU price fell back to a low of around $5.00 and units traded in the low $5's for the rest of May. In the second week of June there was a steady climb from around $5.30 at the beginning of the week, culminating in an exciting Friday afternoon when the price rose nearly $1.00 on the day to close at around $6.80 per NZU. Price increases continued the following week, with the market peaking at $7.10 pior to drifting back to $6.90 at the time of writing. Significant volumes are reported to have been traded. As has been well reported, ERUs are now invalid and emitters are beginning to give attention to procurement for surrender obligations in 2016 and beyond. Last month we reported that the Government had released its consultation on New Zealand's post 2020 targets for inclusion in its Intended Nationally Determined Contribution (INDC) for the purposes of the UNFCCC climate change negotiations in Paris this December. The INDC requires each country to be "fair and ambitious" in the emissions reduction targets that they table later this year in Paris. New Zealand's current emissions reduction target is 5% less than 1990 levels by 2020. The government discussion paper does not propose a new emissions target. However to be "ambitious", our new target would need to be in excess of the current target. Unfortunately, New Zealand's gross emissions are currently 21 per cent above 1990 levels and emissions are increasing. Landcare Research predicts emissions to be 35 per cent higher than 1990 levels by 2030. The government discussion document is particularly vague about specific actions to meet emission reduction targets. It does indicate that New Zealand will continue to rely heavily on the purchase of emission reduction units from offshore to meet reduction targets. Planting marginal farmland in New Zealand could help offset emissions by 2030 at a competitive cost, provided the ETS offered sufficient certainty. This planting would need to commence soon and at a scale that is greater than that offered by the AGS. In the submission by the Parliamentary Commissioner for the Environment, Dr Jan Wright describes the current ETS as little more than a "framework" that has been ineffective in encouraging the reduction of greenhouse gas emissions in New Zealand. "Trust in the ETS needs rebuilding. Foresters in particular feel they have been treated unjustly and frequent changes do not engender investor confidence". She notes forestry as one of the three main opportunities for emissions reductions in New Zealand. She also recommends action to phase out the allocations of free carbon credits to emitters. As it currently stands high intensity emitters could still be paying only 5% of their emissions by 2050. Submissions are now closed and the Ministry for the Environment has received well over 10,000 submissions. We wait for the government response to this INDC consultation process and the mechanisms the government identifies to achieve these "fair and ambitious" emission reduction targets. In the meantime, there is still no indication from the government as to when the 2015 ETS review will occur. 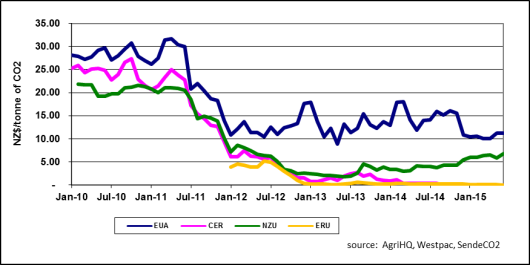 The figure below shows the recent carbon credit prices for EUAs, CERs, NZUs and ERUs. Note that from 1st June 2015 only NZUs or New Zealand AAUs are valid units in the NZ ETS.